Giving Praise to the Lord! 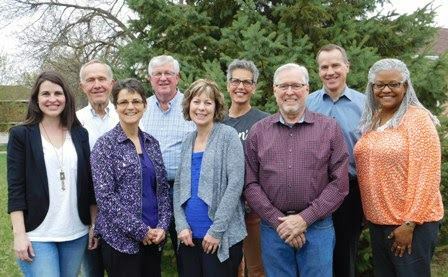 The Dwelling Place Board Members with Executive Director, Linda Wiza (center). We believe in the power of prayer! Each home (Sandy's, Ruth's and Esther's) to be filled with Christ's love and the Holy Spirit to be places of transformation, safety, healing, peace and joy. Each precious woman and child living in Sandy's Place, Ruth's Place and Esther's Place and trusting God as He attends to each and every need with His wisdom, strength, and love. Each case manager (Kassie, Grace, Karla, Cindy, and Jessica) sharing Christ's love daily with women and children as they attend to various needs, provide leadership, input and support, care for children, and engage with volunteers. The Dwelling Place Leadership as they guide and guard The Dwelling Place with faithfulness and dedication to God. Lydia's Place, our 4th home and 2018 summer renovation project. We trust God to provide volunteers to assist once again with the preparation of this home. Every Ministry Partner God provides to share in accomplishing this good work. We are so grateful for each one! The Dwelling Place celebrated "Cow Appreciation Day" at Chick-fil-A! On July 11th, the restaurant celebrated all-things-chicken by giving away one free entree to any customer dressed in cow-inspired attire, and visited before 7pm. Our Executive Director, Linda Wiza, and volunteer, Paul Leverentz, took part in the fun as well as other staff, volunteers, and our kiddos! Our children were even given little stuffed cows and stickers to decorate themselves with! The Dwelling Place staff members. Julia is top row, third from the left. Recently our staff had a going away party for our dear friend Julia Dembeck, who has been an employee of The Dwelling Place for close to 7 years! She is following the Lord's calling and moving on to spend more time with her family (with one on the way! ), and with ministry opportunities within her church, etc. Words can't express how grateful we are to the Lord for the love, grace, and service Julia has given to The Dwelling Place and the precious time she has spent pouring into our women and children. She will be missed by us all! Julia is pictured top row, 3rd from the left.